LOS ANGELES, November 14, 2017 - Ushering in a new dynamic era for Kia Motors, the all-new 2018 Stinger is the culmination of a years-long journey fueled by the company's bold and adventurous spirit. A five-passenger sportback poised to redefine a segment currently populated by European automakers, the Stinger promises to be the highest-performance production vehicle in the company's history and is backed by Kia's industry-leading warranty. Offered in five trim levels (Stinger, Premium, GT, GT1, GT2) and luxurious accommodations, the Stinger is planned to go on sale in the U.S. in December. 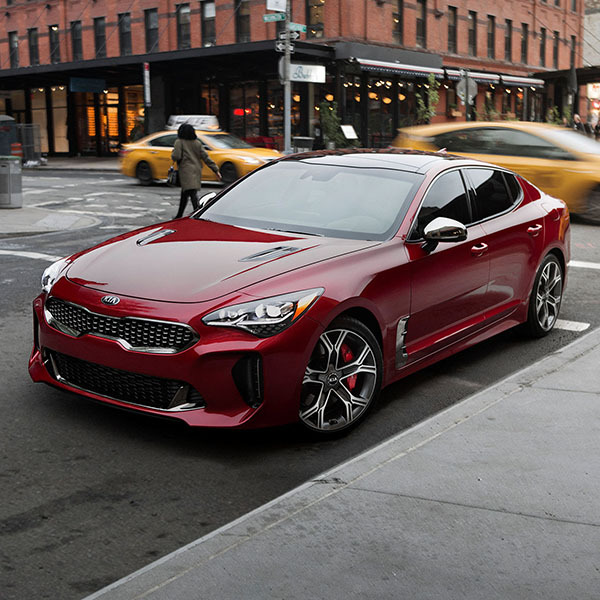 "Unlike any Kia that has come before it, the Stinger really is a dream car for us and after years of commitment and hard work from a passionate group of designers, engineers and executives around the world, that dream is now a reality," said Orth Hedrick, vice president, product planning, Kia Motors America. "From its GT Concept-car origins to its tuning and refining on the legendary Nurburgring circuit, no detail was too small to be obsessed over, and the result is simply stunning." 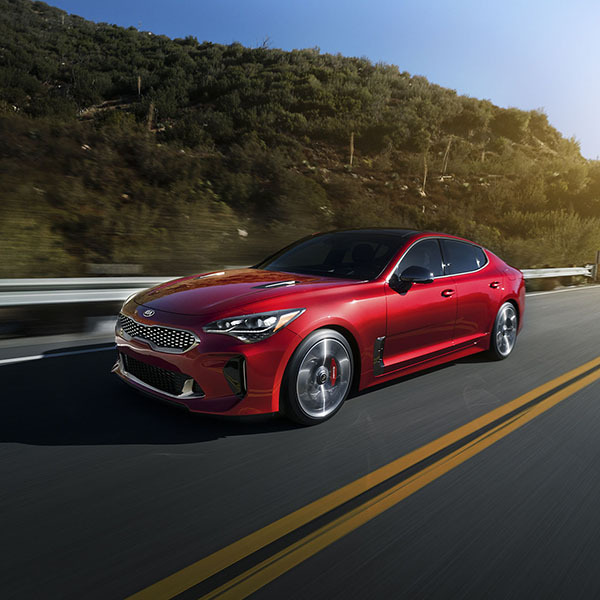 Instantly recognizable as a direct evolution of the concept that preceded it, the all-new 2018 Kia Stinger design was overseen by Peter Schreyer, Kia Motors' chief design officer, and his talented team of designers in Frankfurt. Ride and handling development was looked after by Albert Biermann, head of Kia's Vehicle Test and High Performance Development and his group of engineers in Korea and on the grueling Nurburgring racing circuit. But what makes a true gran turismo? This question was the foundation for a years-long journey that began when the GT Concept was first unveiled at the 2011 Frankfurt Motor Show. Although every Kia design study has a purpose, the GT Concept was something considered by many outside the company as little more than a dream for a brand known for producing mass-market transportation rooted in value. But the GT Concept ignited embers of passion that sparked a fire within the organization and, over the next five years, that fire would grow beyond fantasy and morph into reality. Turning a concept into a production car is no small task and Schreyer looked no further than Kia's Frankfurt studio - the birthplace of the GT Concept - to bring the Stinger to life. "A true gran turismo, a car for spirited long-distance driving, is not about outright power, hard-edged dynamics and brutal styling, all at the expense of luxury, comfort and grace," notes Gregory Guillaume, chief designer, Kia Motors Europe. "The Stinger has nothing to do with being the first to arrive at the destination - this car is all about the journey. It's about passion." From its sleek front clip through its svelte flanks, and up to its powerful haunches, the Stinger exudes a muscular confidence. Key to its road presence are the rear-wheel-drive proportions; a long hood and short front overhang, an extended wheelbase to deliver a spacious cabin, and a long rear overhang with strong shoulders. The Stinger's stance and visual balance are designed to lend the car an air of elegance and athleticism, rather than boy-racer aggression. The wide front and rear track, along with the recessed contours along the doors, enhance the visual power of the Stinger's shoulder line as well as its sportback silhouette. Other functional elements of the exterior design include large air intakes and air curtains in the front, a smooth underbody, and a rear diffuser on the GT trim enhances aerodynamics, while also reducing lift. The rear valance houses four oval exhaust pipes. Kia's signature 'tiger-nose' grille sits proudly between complex LED headlamps. The low-slung cabin with its steeply raked windshield and backlight sits toward the rear of vehicle, creating a fast silhouette. Inside is a space dedicated to the thrill of driving while cossetting the occupants in luxury. Typically a high-cost option on most competitors, all Stingers come standard with a leather-appointed interior. Available ultra-soft Nappa leather covers the deeply contoured seats and the driver's seat has available air-cell bladders in the seatback and width-adjusting bolsters for optimal support and comfort. A confident dashboard creates a strong horizontal plane for the driver to work behind. The center console is intuitively split into two specific areas: the infotainment controls sit neatly below a large color touchscreen, while the climate and ventilation controls nestle beneath. Front and center of the driver is a thick hand-stitched multifunction leather-wrapped steering wheel with paddle shifters; the GT trim gets a "D" shaped steering wheel. The large gauges are ringed in metal and accentuated with sweeping red needles. An available color TFT screen between the gauges relays performance data such as cornering G-forces, lap times and engine-oil temperature, along with ancillary information such as the trip computer, driver settings, navigation and diagnostics. Aeronautically inspired spoked circular vents are found front and rear and a tasteful satin chrome ring encircles the cabin. The effect is a feeling of cocooned intimacy, enhanced with warm and inviting available multi-color LED ambient lights that softly illuminate the finely crafted interior. The long wheelbase allows for generous front and rear leg room and the low seating position provides ample head room front and back. Kia's Frankfurt R&D center used computational fluid dynamics (CFD) software to test and validate different ideas to enhance the car's aerodynamic profile while retaining the fastback silhouette, which can pose more challenges than conventional sedan designs. The bodywork was tapered slightly towards the rear of the car and new 'gills' were introduced behind the front wheel arches, each serving to reduce wake turbulence as air passes over the car's flanks. A partially-flat underfloor cover flowing into the rear diffuser reduces drag under the car, while the rear spoiler was modeled with a slight 'ducktail' shape, reducing lift and increasing high-speed stability. At the front, large horizontal cooling ducts were introduced to optimize brake cooling, and air inlets are shaped to reduce front-end lift. Finally, Kia's aerodynamicists found that reducing the height of the rear of the roof enhanced the fastback's 'aerofoil' shape and improved the Stinger's aerodynamic efficiency at the same time. The result is a drag coefficient of 0.30 Cd. Joining the company from BMW in December, 2014, Albert Biermann's first look at the Stinger signaled to him a car that had to live up to its stunning design from behind the wheel. 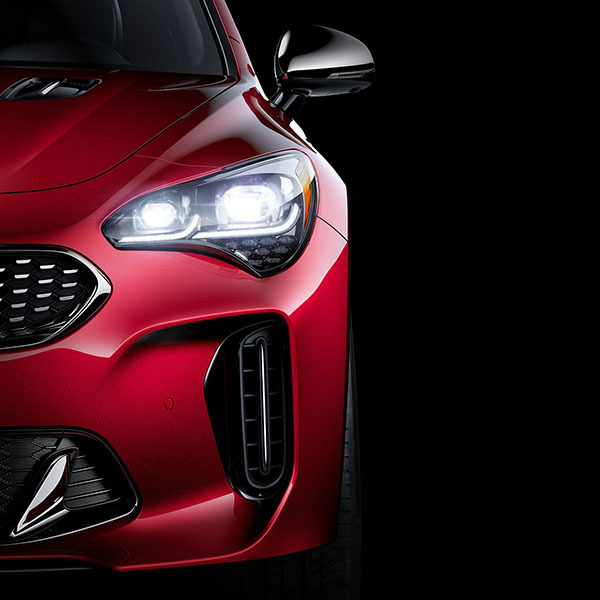 "I think for the Kia brand, the Stinger is a very special moment in time," notes Biermann. "Because nobody expects such a car, not just the way it looks but also the way it drives. It's a whole different animal." The car's development took place across Europe, the Middle East, Asia and North and South America, but the Nurburgring's grueling Nordschleife is where the Stinger was honed. With 73 corners, nearly 1,000 feet of elevation and 17 percent gradients, the "Green Hell" can chew up and spit out a car of lesser mettle in just one lap. Kia's engineers put every development Stinger through a minimum of 480 laps (equivalent to 6,214 miles) of high-stress driving around the Nordschleife for quality, reliability and durability testing. The constant combination of hard acceleration, rapid deceleration, heavy cornering, changing surfaces and camber offers an unrivaled test of dynamic prowess and the distance covered during the Stinger's development resulted in nearly 100,000 miles of on-road testing. Setting the manufacturing hard-points of the body-in-white would define Stinger and the engineers looked carefully across a landscape dotted with contenders. At 114.4 inches, the Stinger's wheelbase is longer than the Audi A5 Sportback, Infiniti Q50, Lexus IS, BMW 4 Gran Coupe and the Lexus GS5. It's also longer overall (190.2 inches) and wider (73.6 inches) than several others in the segment. With a generous 23.3 cu.-ft. of cargo space, the Stinger's cargo area is also larger than many of its competitors, with enough space for full-size luggage or golf bags and a power liftgate with Smart Trunk functionality is available. 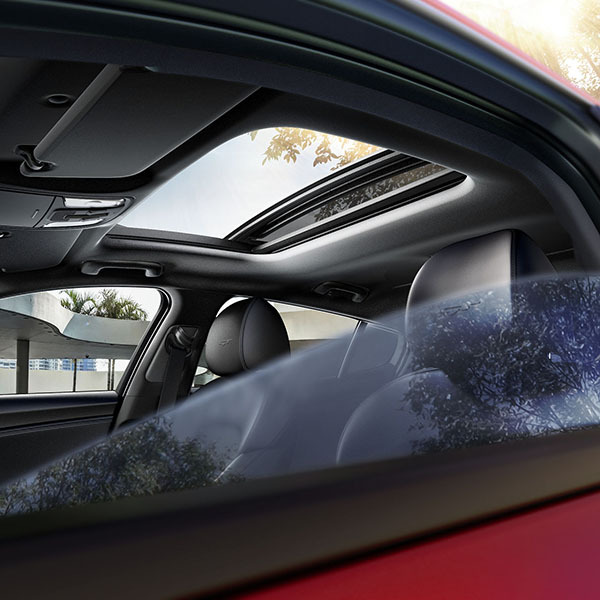 The spacious accommodations provide more interior volume than its competitors, including the BMW 6 Series Gran Coupe, 4 Series Gran Coupe, Audi A5 Sportback, and the Lexus GS6. Riding on a chassis comprised of 55 percent advanced high-strength steel, the Stinger provides an ultra-stiff foundation for the ride-and-handling engineers to work with. This rigidity also helps to reduce NVH for a quieter cabin. The MacPherson front setup features large diameter shock absorbers, high-strength wheel bearings, and an aluminum strut brace, while the reinforced five-link rear suspension is mounted to a stiffened rear subframe. 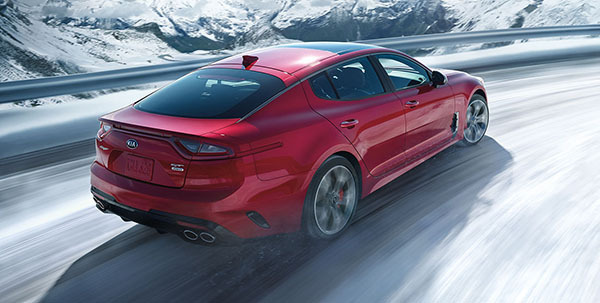 The base Stinger rides on a passive suspension tuned to offer a balance of handling and ride comfort, while the GT is equipped with Kia's first continuously damping electronically controlled suspension, called Dynamic Stability Damping Control. While aiming to predict the driver's inputs, depending on road conditions and driving style, the Stinger can be tuned to respond with more agility through corners as the system softens the front shocks and firms up the rear. Conversely, improved high-speed stability is achieved when the system stiffens the front shocks and softens the rear. The system is accessed by the driver through five modes (another first for Kia): Custom, Eco, Sport, Comfort and Smart. Standard Rack-mounted Motor Driven Power Steering (R-MDPS) offers razor-sharp feedback through direct mounting of the electric motor on the steering rack, enhancing steering response and reducing unwanted vibration from transmitting through the column. Variable ratio steering is standard on the GT trim and provides different ratios depending on steering angle, resulting in slower off-center steering and providing improved high speed stability. 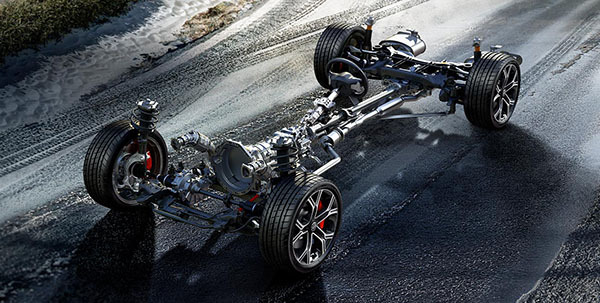 If the chassis symbolizes the bones of a gran turismo, then surely the available powertrains represent its heart. Oriented longitudinally and set rearward beneath the long, sculpted hood, a choice of two turbocharged engines are available. 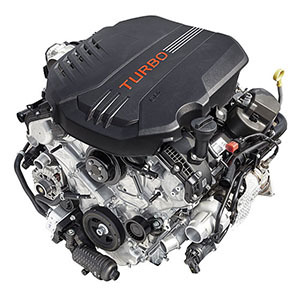 The 2.0-liter twin-scroll turbocharged four-cylinder Theta II engine produces 255 horsepower at 6,200 rpm with 260 lb.-ft. of maximum torque available from 1,400 - 4,000 rpm, propelling the Stinger from 0-60 mph in just 5.9 seconds. 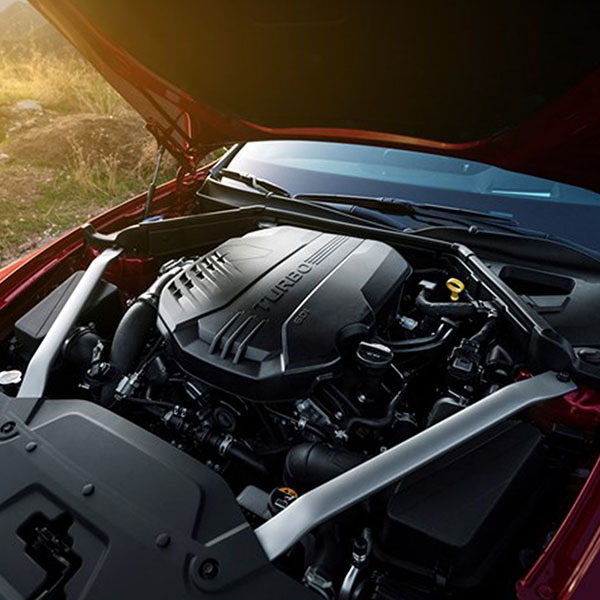 Performance credentials are further enhanced through the available 3.3-liter twin-turbo V6 Lambda II engine, which produces 365 horsepower at 6,000 rpm and offers 376 lb.-ft. of torque from 1,350 - 4,500 rpm. With more power on tap than the Audi S5 Sportback, BMW 440i Gran Coupe, and Infiniti Q50, the Stinger GT is positioned to be a worthy challenger to the competition. As such, the Stinger GT accelerates to 60 mph in 4.7 seconds, quicker than the six-cylinder Porsche Panamera. Pushing the twin turbocharged V6 to its full potential will allow the Stinger GT to achieve a governed top speed of 167 mph. The Stinger features an in-house designed second-generation eight-speed rear-drive automatic transmission. 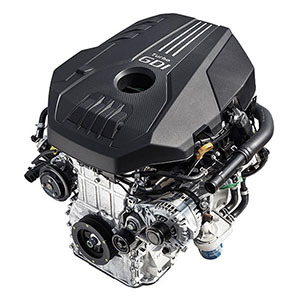 More typically found in aviation- and racing-engine applications, the transmission features Kia's first use of a Centrifugal Pendulum Absorber (CPA) torque converter on the 2.0L to help reduce torsional vibrations through the drivetrain and has been designed with an oil cooler to more efficiently handle heat build-up. Drivers can let the gearbox manage shifts on its own or may selectively run through the gears via paddle shifters mounted aft of the steering wheel. As with the suspension and steering, up to five different shift patterns may be selected through the vehicle's electronic drive-mode system. Throttle mapping is also adjusted accordingly. 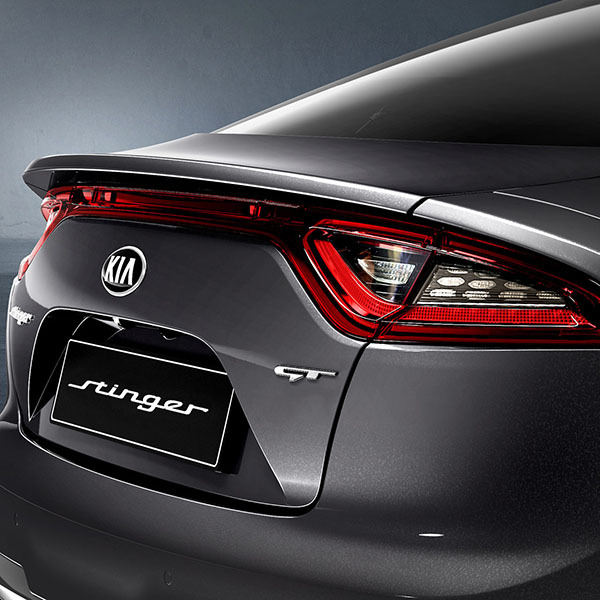 Recognizing that passionate drivers may not always reside in optimal climes, the Stinger is Kia's first sedan available with rear- or all-wheel drive. Rear-wheel biased for optimal control in the wet or dry, the AWD system features a new Dynamic Torque Vectoring Control system which monitors driver inputs and road conditions and automatically applies power and braking force to the appropriate wheels to help maintain course in a variety of adverse conditions. The system freely distributes torque between the front and rear wheels and also can send power from side to side, depending on driving conditions. Should the system detect slippage, power is seamlessly directed towards the front or rear wheels, depending on the driving situation. Up to 50 percent of torque can be distributed to the front wheels, and in Sport mode up to 80 percent of the power can be routed to the rear wheels. Rear-drive GT2 models get the benefit of an available multi-plate limited slip differential to help evenly distribute power through the rear wheels and enhance directional stability. A choice of alloy wheels and tires is also offered. The 2.0-liter turbocharged four-cylinder models ride on 225/45R-18 performance all-season tires while the 3.3-liter V6 is shod with staggered ultra-high performance Michelin Pilot Sport 4 tires that have been specifically engineered and tuned for the Stinger; 225/40R-19 in front and 255/35R-19 at the rear. Engineers subjected the Stinger to a variety of high-speed braking tests, including continuous runs down the infamous Grossglockner High Alpine Road in the Austrian Alps for constant downhill brake testing. 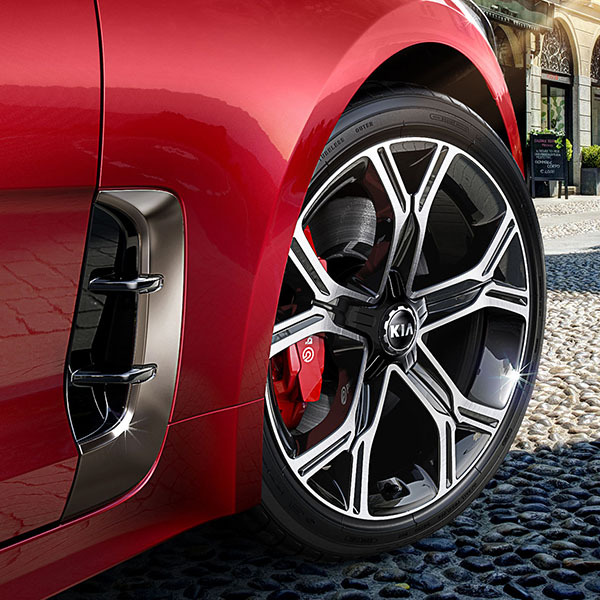 The Stinger GT's stopping power comes from standard high-performance Brembo® disc brakes featuring quad-piston front calipers and dual-piston rear calipers, which were subjected to temperatures of more than 1,400 degrees Fahrenheit during their development. The lightweight monobloc all-aluminum calipers reduce unsprung weight and are coupled with large diameter brake discs (13.8-in. front and 13.4-in. rear) that quickly dissipate heat and deliver extremely short stopping distances. In the United States, The National Highway Traffic Safety Administration estimates that 72,000 police-reported crashes involved driver fatigue each year. This results in an estimated 800 deaths, and 41,000 injuries annually. A Kia first is the new Driver Attention Warning (DAW) system to help combat distracted or drowsy driving. The system monitors a number of inputs from the vehicle and the driver and will sound a warning chime and display a graphic in the instrument binnacle that it's time to take a break from driving if it senses the driver's attention level has been significantly reduced. Forward Collision Avoidance (FCA) with pedestrian detection is designed to monitor vehicles and pedestrians ahead of the vehicle, and if it detects a potential collision with another vehicle or pedestrian, it works to help bring the car to a halt. Smart Cruise Control with Stop & Go (SCC w/ S&G) is designed to maintain a pre-set distance between the Stinger and the vehicle in front and can bring the car to a full stop in traffic. 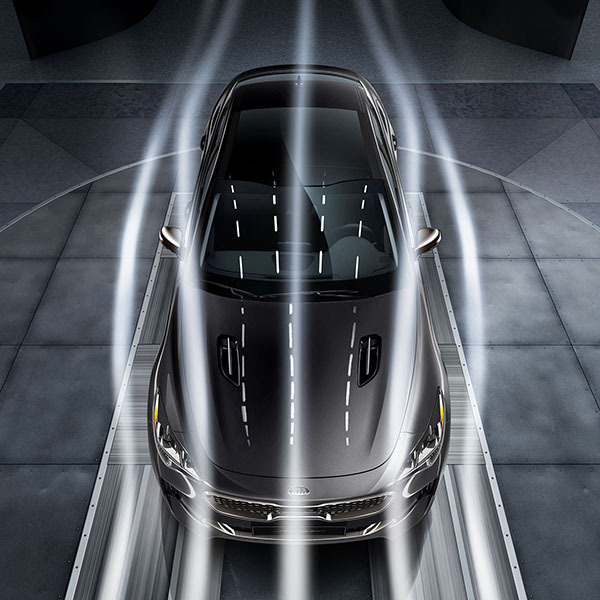 Lane Keeping Assist (LKA) is designed to detect and monitor the vehicle's intended lane and in certain situations, alert the driver with an audible warning along with providing steering input to help maintain the vehicle's position. Blind Spot Collision Warning (BCW) includes Rear Cross-Traffic Collision Warning (RCCW) which scans the area behind the vehicle when backing from a parking space and can alert the driver with an audible warning if it detects cross traffic. Connectivity, entertainment and vehicle information can be as important as a dynamic driving experience and the Stinger comes to market with the latest infotainment systems. The available height-adjustable color Head-Up Display (HUD) display enables the driver to see driving information projected on the windshield glass, including speed, turn-by-turn navigation, audio and cruise control settings and Blind Spot Detection information. Bluetooth® hands-free operation is standard while many of the vehicle's subsystems may be accessed through the steering-wheel-mounted controls. Long-distance travel is a hallmark of the gran turismo ownership experience and there is a trio of high-performance audio systems designed to turn the interior into a dynamic concert hall as the miles blur by. The base audio system for the 2.0-liter turbo features six speakers and a seven-inch touchscreen with the latest version of UVO, Kia's award-winning telematics systems. 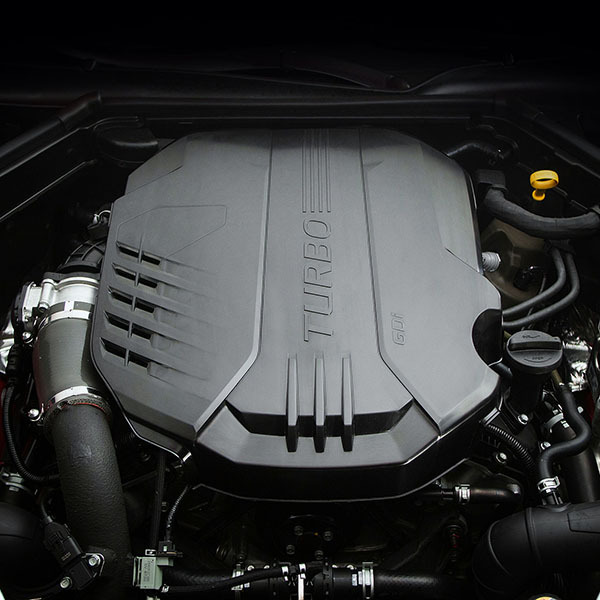 The standard system found in the 3.3-liter twin turbo ups the speaker count to nine and includes an external amplifier. The available premium Harman/Kardon® audio system pumps out 720 watts through an external amplifier to provide crystal-clear music. With 15 speakers and Kia's first under-seat mounted subwoofers tucked beneath the driver and passenger seats, the system features Clari-Fi™, a patented music restoration technology that rebuilds audio signals that are lost in the digital compression process. This technology returns a high-fidelity listening experience to any compressed digital source. The system also comes equipped with next-generation QuantumLogic™ Surround Sound technology, which extracts signals from the original recording and redistributes them into an authentic, multidimensional soundstage for playback that is clear, refined and full of detail.